The service counters from Store Supply Warehouse are designed with practicality in mind. 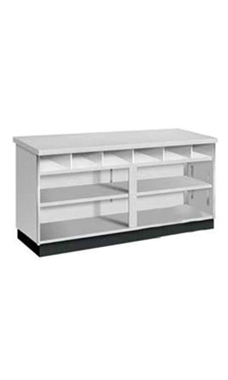 The Metal Framed Gray 70" service counter features adjustable rear storage shelves and bins to house supplies, tools or bags, increasing productivity and efficiency, leaving the customers happy with their service. With a gray melamine laminate exterior and aluminum metal frame, the service counter will add a sleek modern look to any retail business. The 34" high counter top surface complies with ADA guidelines. The counter also features fully finished sturdy 3/4" top, sides, shelves and front lower panel and a recessed black kick-plate. Overall measurements include 34"H x 24"D x 70"L. Ready to ship.